Saturday: Mostly cloudy, snow showers, especially south. Highs around 20. Saturday Night: Gradual clearing. Lows in the single digits and teens. Sunday: Mostly sunny, windy and cold. Highs in the teens. Not only are we off to a bitter cold start, we’re tracking the return of snow showers. Flurries have already started in Western Connecticut and in the Berkshires, and these will continue to spread eastward into the afternoon hours. This afternoon brings snow showers across southern New England, enough to create slick travel and reduced visibilities at times. By dinner time Saturday evening, snow will be increasing in coverage for the Cape and the Islands where snowfall accumulations are expected to be the highest. A Winter Weather Advisory has been issued for Cape Cod and the Islands through 1 a.m. Sunday. On the back side of the system, it’s likely we’ll see ocean-effect snow showers on the Outer Cape and Islands, so we could see locally higher amounts under some of these ocean-enhanced snow bands. Between 2-4 inches of snow is expected for coastal Southeastern Massachusetts and the Cape and Islands, with up to five inches possible for the Outer Cape, 1-2 inches for coastal Rhode Island and Connecticut, while a dusting to an inch is expected elsewhere along and south of the Mass Pike. The system exits just in time for the second half of the holiday weekend, but that’s when we’re in for another arctic cold blast. Planning on going to the Patriots game Sunday afternoon? Wear plenty of layers! Temperatures will be in the teens by the 1 p.m. kickoff, and we’ll have a brisk breeze out of the northwest nearing 20 mph, making for wind chills near zero. Wind chills are expected to be even colder north and westward, which is why a Wind Chill Advisory has been posted for western Massachusetts, all of Vermont, northern New Hampshire, and most of Maine for Saturday night and through most of Sunday as wind chills will be between 15 to 30 below, enough to create frostbite to exposed skin in 30 minutes or less. For New Year’s Eve Day, get ready for bitterly cold conditions with highs in the 10s, and lows getting close to zero as we countdown to midnight. Highs remain between 10-15 degrees to start off the first couple days of 2018. We will be back to the mid to upper 20s by the middle of the week before another round of highs into the teens for late next week into the first half of the first full weekend of 2018. The next chance for accumulating snowfall looks to be Thursday into Friday, so we’ll be keeping an eye on that system as we get closer. 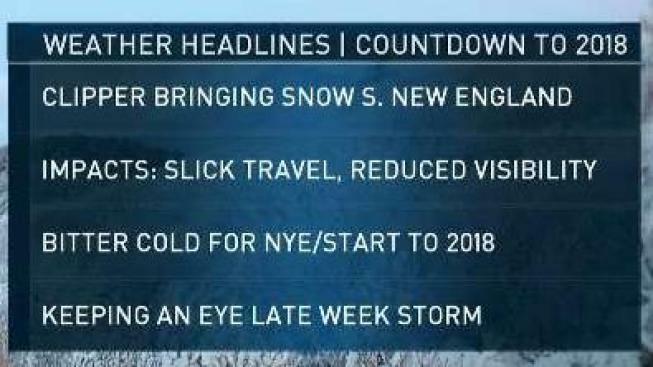 For now, enjoy the last few days of 2017 and bundle up as we count down to 2018! Wishing everyone a happy and healthy New Year.